The men’s collegiate eight crews make their way down course on a picture perfect day for the Head of the Charles. They were dead in the water, tangled up in red, white, and blue as Harvard’s defending champions headed for the horizon. But Washington’s men’s crew didn’t travel 2,500 miles to strike its colors. “We said, keep the boat moving,” said bowman Alexander Perkins. “Let’s get out of here without hurting anyone.” So the Huskies unhooked themselves from their US Rowing rivals, who’d forced them to a full stop just as they were coming out of Dead Man’s Curve before the Eliot Bridge. 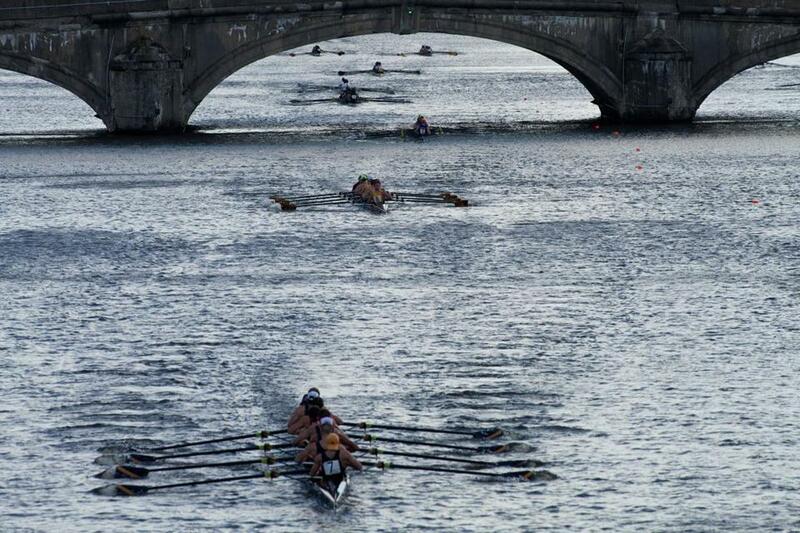 Then they mashed the accelerator, went supersonic to the finish, and reclaimed their title Sunday afternoon at the 48th Head of the Charles Regatta thanks to a jury decision overturning a 10-second buoy violation that originally had given the Crimson the victory. For a couple hours after the unofficial results went up the Crimson thought that they’d become the first US college crew to retain the title since Navy in 1983. They’d actually made the triumphant walk up from Newell Boathouse to the awards tent, not knowing that Washington coach Mike Callahan had filed an appeal at the Cambridge Boat Club headquarters. “Oh, well, it was fun for a while,” concluded Crimson cox David Fuller, after officials concluded that there was reasonable doubt that the original buoy call at the Belmont Hill dock was correct. The US eight had to huff and puff through the last quarter of the race before coming through as they bulled their way down the 3-mile course. The women’s Great Eight, composed of Olympic scullers from as many countries who were rowing under the CBC banner, wasn’t so lucky in the jury room where their appeal of their own buoy violation before the bridge was denied. The US boat, which clearly was at fault, drew three minutes in interference penalties and ended up last in the 28-boat field. “You’re supposed to yield to the faster boat and that didn’t happen,” said Callahan. While the two boats were entwined, the Crimson had the river all to themselves. They’d earned the first starting spot by last year’s victory, their first since 1977. While this was a different boat, with four sophomores joining three veterans from last summer’s Henley victors, they thought they had sufficient octane to hang with a group that also included a Great 8 peopled by five members of the 2009 champs, most notably Olympic singles gold medalist Mahe Drysdale. “We knew Washington was going to be very fast, but we knew we would have had a shot,” acknowledged stroke James O’Connor. “When we crossed the line we said, ‘maybe.’ We knew we’d done well.” The question was whether the Huskies could recover from the car wreck quickly enough to make up the lost time. So they revved up the rating to 40 strokes a minute, shot through the bridge, and opened the throttle. “It was an incredible challenge for our team and I think they rose to the occasion,” said Callahan. Washington’s time of 14:37.27 was more than five seconds faster than Harvard’s 14:42.35. The issue was whether the Huskies had missed the buoy. Labrum swore they hadn’t and after his father Bill submitted the photo sequence from his phone, the jury agreed. “It seemed to be fairly clear to us that the hull stayed on the correct side of the buoy,” said John Lambert, the regatta’s managing director for rules. After Harvard beat Washington here last autumn, U-Dub exacted revenge at last spring’s IRA national championships. Win or lose, the Head provides a motivational spark that burns through the winter. The next time the Crimson and Huskies meet it’ll be on Lake Natoma in Sacramento at the end of May. No turns, no bridges, and none of Uncle Sam’s errant nephews in the way.